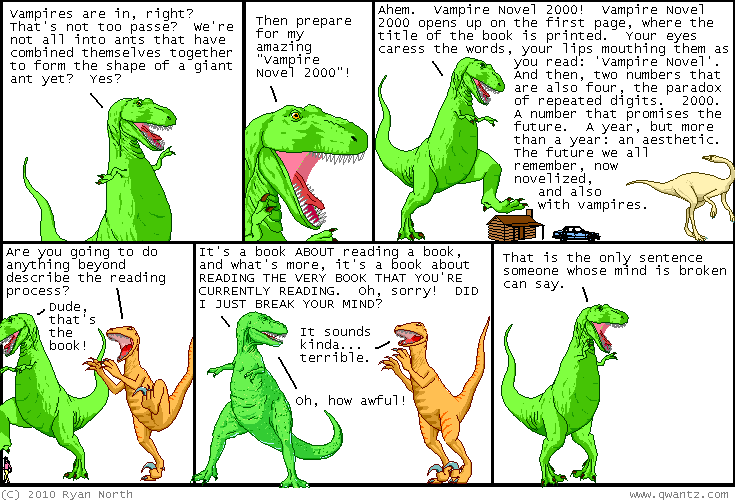 Dinosaur Comics - June 24th, 2010 - awesome fun times! June 24th, 2010: So with the Samantha and Martin story posted here this week I got a few emails from people who HAVE had successful relationships that began with Dinosaur Comics shirts, and as I was walking home barefoot yesterday on account of a situation, it inspired in me an idea, an experiment. And it's an experiment that you can take part in! Tomorrow, Friday, is the first ever "Feel Free To Say Hi If I'm Wearing A Dinosaur Comics Shirt Day, Woooooo!" Okay, so the problem is - what if you're happily in a monogamous relationship or if you're NOT looking for anyone or whatever? You can not wear your shirt tomorrow, or if you do, you can politely let folks down easy as I'm sure you're used to doing, and I say this because every reader of my comic I've ever met is attractive. Not even a joke there. It's kinda crazy. Good luck everyone!! Here's what to wear and what to keep an eye out for. Everyone find happiness, OKAY??? One year ago today: utahraptor you can definitely make it win a few pulitzers, okay?